According to the Cal Recycle website the measure became effective 9 November 2016. Regarding a grace period, the website states: “When Governor Brown signed SB 270 in 2014, the effective dates of the bill’s statutory requirements would have allowed a grace period prior to the onset of the law’s ban on distribution of single-use plastic bags and requirement for stores to charge customers at the point of sale for recycled paper bags and reusable grocery bags. However, when the referendum qualified for the November 2016 ballot, implementation of SB 270 was suspended. Proposition 67 passed and the law is in effect as originally written.” (CalRecycle, 2016) This means shoppers should expect to be charged 10-cents for each store provided paper or plastic reusable bag next time they shop. To avoid those fees, simply bring your own bags of any type or do not use carryout bags at all. The key provisions of SB-270 are outlined below and are taken from the language of SB-270 but have been modified for clarity and readability. Readers are referred to the actual legislation at: SB-270 (Padilla) for additional information. A store that makes reusable grocery bags or recycled paper bags available for purchase at the point of sale shall provide a reusable grocery bag or a recycled paper bag at no cost at the point of sale to a customer using a payment card or voucher issued by the California Special Supplemental Food Program for Women, Infants, and Children (WIC) or an electronic benefit transfer card issued pursuant to the Welfare and Institutions Code (Food Stamp Program). On and after July 1, 2015, a store may distribute a compostable bag at the point of sale, if the compostable bag is provided to the consumer at the cost of not less than ten cents ($0.10) per bag and a majority of the residential households in the jurisdiction have access to curbside collection of food waste for composting and the local jurisdiction has voted to allow stores in the jurisdiction to sell compostable bags to consumers at the point of sale. A store shall not require a customer to use, purchase, or accept a single-use carryout bag, recycled paper bag, compostable bag, or reusable grocery bag as a condition of sale of any product. All moneys collected from the sale of paper or reusable bags shall be retained by the store and may be used only for the following purposes: (a) Costs associated with complying with the requirements of this article. (b) Actual costs of providing recycled paper bags or reusable grocery bags. (c) Costs associated with a store’s educational materials or educational campaign encouraging the use of reusable grocery bags. On or after 1 July 2015 a store may only sell or distribute a reusable grocery bag to a customer only if the reusable bag is made by a manufacturer who has certified to the State of California that the reusable bag meets all the following requirements: (1) has a handle and is designed for at least 125 uses; (2) has a volume of at least 15 liters; (3) is machine washable or made from a material that can be cleaned and disinfected; (4) has a label with the name of the manufacturer and country of manufacture and recycling information and recycling symbols. A reusable bag made from plastic film (e.g. a thick plastic carryout bag) shall contain at least 20% postconsumer recycled material after January 1, 2016 and 40% recycled content after January 1, 2020. The bag shall be at least 2.25 mils thick and capable of carrying 22 lbs. over a distance of 175 feet for a minimum of 125 uses. The bag shall be recyclable in the state and accepted for recycling via the at-store recycling program. A reusable grocery bag made from compostable plastic film that meets the specifications of the American Society of Testing and Materials (ASTM) International Standard Specification for Compostable Plastics D6400, as updated, is not required to meet the requirements for post-consumer content, but shall be labeled in accordance with the applicable state law regarding compostable plastics. A reusable grocery bag that is not made of plastic film and that is made from any other natural or synthetic fabric, including, but not limited to, woven or nonwoven nylon, polypropylene, polyethylene-terephthalate, or Tyvek, shall satisfy all of the following: (1) it shall be sewn. (2) It shall be capable of carrying 22 pounds over a distance of 175 feet for a minimum of 125 uses. (3) It shall have a minimum fabric weight of at least 80 grams per square meter. (d) On and after July 1, 2016, a store shall comply with the requirements of this section. A producer of reusable grocery bags made from plastic film shall not sell or distribute a reusable grocery bag in this state unless the producer is certified by a third-party certification entity. A producer shall provide proof of certification to the state demonstrating that the reusable grocery bags produced by the producer comply with the provisions herein. The proof of certification shall include all of the following: (a) Names, locations, and contact information of all suppliers of postconsumer recycled material. (b) Quantity and dates of postconsumer recycled material purchases by the reusable grocery bag producer. (c) How the postconsumer recycled material is obtained. (d) Information demonstrating that the postconsumer recycled material is cleaned using appropriate washing equipment. A reusable grocery bag producer shall resubmit to the State of California proof of certification on a biennial basis. A reusable grocery bag producer shall provide the state with an updated proof of certification conducted by a third-party certification entity if any modification that is not solely aesthetic is made to a previously certified reusable bag. A third-party certification entity shall be an independent-accredited (ISO IEC 17025) laboratory. A third-party certification entity’ shall certify that the producer’s reusable grocery bags meet the requirements of SB-270. 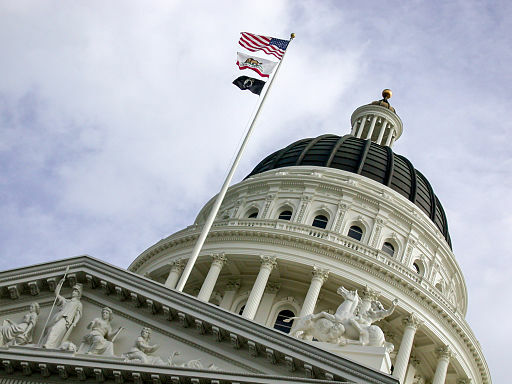 The State of California shall establish an administrative certification fee schedule that will generate fee revenues sufficient to cover-but not exceed the reasonable costs to implement the certification process. A reusable grocery bag producer shall submit applicable certified test results to the State of California confirming that the reusable grocery bag meets the requirements of SB-270 for each type of reusable grocery bag that is manufactured, imported, sold, or distributed in the state and provided to a store for sale or distribution. In addition, a reusable grocery bag producer shall submit the fee established when providing proof of certification or recertification. A city, a county, a city and county, or the state may impose civil liability on a person or entity that knowingly violated this chapter, or reasonably should have known that it violated this chapter, in the amount of one thousand dollars ($1,000) per day for the first violation of this chapter, two thousand dollars ($2,000) per day for the second violation, and five thousand dollars ($5,000) per day for the third and subsequent violations. A city or county that has adopted , before 1 September 2014, an ordinance, resolution, regulation, or rule relating to reusable grocery bags, single-use carryout bags, or recycled paper bags may continue to enforce and implement that ordinance, resolution, regulation or rule that was in effect before that date. Any amendments to that ordinance, resolution, regulation, or rule on or after January 1, 2015 shall not be enforced except the public agency may adopt or amend an ordinance, resolution, regulation, or rule to increase the amount that a store shall charge with regard to a recycled paper bag, compostable bag, or reusable grocery bag to no less than the amount specified herein (i.e. 10-cents). A sum of two million dollars is appropriated for the purpose of providing loans for the creation and retention of jobs and economic activity in this state for the manufacture and recycling of plastic reusable grocery bags that use postconsumer recycled content. The funds may be used for the development and conversion of machinery and facilities that manufacture single use plastic bags into machinery that makes durable or reusable grocery bags. Bacterial and Viral Health Hazards of Reusable Shopping Bags – This is an updated article of a previously posted article. In addition to format changes, coverage of the potential that a reusable bag could transmit the Ebola virus was included. Reusable Bags and Ergonomic Issues – This article examines ergonomic issues related to reusable bags and risk of injury from lifting and handling reusable bags that can weigh more than the plastic bags they replace. The California Plastic Bag Ban Scam – A new article that exposes the methods used by bag banners to push for bag bans at the local and state level through deceitful scheming, lies and distortions, backroom deals, one-sided media, and politicians succumbing to a heavy dose of political correctness. Eliminating Competition Is the Real Reason behind Bag Bans – This article discusses how plastic bag bans are nothing more than crony capitalism and designed to generate and protect bag revenue from competition. California Landfills Impacted By Bag Bans – This article is an update of the article previously titled “Fact Sheet Landfill Impacts LASBVTA“. The article now looks at the impacts to landfills across the State of California along with Santa Barbara and Ventura Counties. San Jose Litter Surveys Examined – Plastic Bag Ban Completely Unjustified – This article shows that San Jose’s own Litter Surveys show the litter problem associated with single-use plastic carryout bags is Insignificant and that reported reductions of these bags are inconsequential. San Jose Discovers Bag Ban Does Not Solve Litter Problems – This article shows that San Jose’s bag ban did nothing to solve the city’s serious litter problems and the city’s own litter surveys show that the bag ban was not needed. Plastic Bag Recycling Rate – A Non-Issue – This article exposes the truth about the 5% plastic bag recycling rate and why that recycling rate is so low and why the low recycling rate is not a reason to ban plastic carryout bags. NOT QUITE YET………There are absentee ballots yet to be counted and w won’t know how that turns out for at least a month. Hopefully the absentee ballots are from more conservative regions and those who actually bother to read the text of the legislation rather than just vote following media generated recommendation lists.